New album Day & Age drops 24, 25 Nov. The Killers are about to release their best album yet, Day & Age, and they're going to support it with an 18-month world tour. The first batch of dates have just been announced. 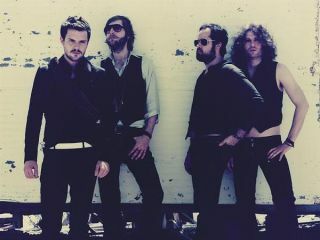 The Killers will kick off their tour in the US in Denver, Colorado on 17 January and play shows across the country, including one at New York's Madison Square Garden on 25 January and at Nashville's Grand Ole Opry House on 31 January. They'll wrap up the US leg of the tour (and will no doubt be returning in the spring or summer) in Grand Prairie, Texas on 4 February. Then it's off to the UK and Ireland for a string of dates that include Dublin's O2 Arena (20 February) and a pair of shows at London's O2 Arena (23, 24 February). And in perhaps more exciting news, look for an exclusive MusicRadar podcast interview with Killers' guitarist Dave Keuning in the coming weeks.